A review of the social media promotions for Aashiqui 2 world television premiere on SET Max with Facebook apps, where fans can upload couple pics to be aired during the telecast. Television is still the most popular source of entertainment in India and romance the most popular genre in Indian films. So when a romantic film like Aashiqui 2 is scheduled for a world television premiere, the makers are leaving no stone unturned to create the maximum buzz possible. SET Max is all set for the world television premiere of Aashiqui 2 on the 28th of July, with an array of activities planned both online and offline. As reported on AFAQS, several initiatives have been taken up across different cities to gear up the youth, of which there are musical bus stops, models as mannequins and a rose board that unveils the poster as the roses are plucked! Additionally, the television premiere is creating some love waves on social media especially Facebook. The Set Max television Facebook page has begun promotions from the 15th of July with a brand new cover page, updates and engaging Facebook apps. From asking fans to tweet with a particular hashtag and sharing promo videos to driving them to participate in the contests, the Facebook page is quite actively engaging the more than 1.2 million fan base. 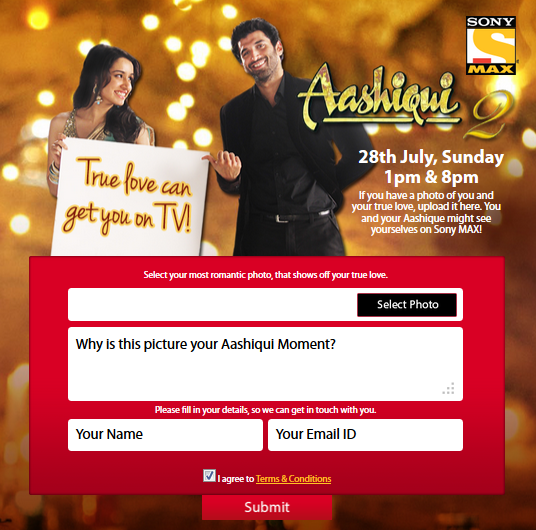 There is Aashiqui 2 Moments Facebook app, where you can upload you and your partner’s picture and stand a chance to have them displayed during the television premiere of the movie. The app gives you access after you like the page. Upload the photo and the reason as to why it is your ‘aashiqui‘ moment and submit along with name and email id. There will be 3 daily winners and 25 final winners who will have their photos “appear juxtaposed alongside the end-credits of the Film” in the 10-day contest. And in case you have more photos, which you will have for sure, the app allows for multiple entries. For lovestruck fans, there is ‘Aashiqui 2 Love Meter‘ where couples can find out their Aashiqui 2 quotient, after ‘liking’ the page. Enter your name, age and favourite colour along with your partner’s name, age and favourite colour to get the Love Meter on. It calculates your love quotient in percentage, which you can then share on your wall. You can try the app over and over again with different parameters. The irony is that even with the same names and colours, there is a different love quotient generated by the app every time. Here it says 34 % and another time it said 96%, which was quite heartening. Users on Twitter have been encouraged to tweet with the hashtag #Aashiqui2onMAX, with a promise of exciting prizes for the most innovative ones. SET Max has more than 104K followers on Twitter. Social media’s two-way communication is being increasingly leveraged by television channels. Be it for the launch of a new TV series or a movie premiere, television channels are exploring the medium in as many ways as possible. For the television premiere of The Amazing Spiderman on Sony PIX, the channel ran a phase-wise strategy that ensured maximum viewership for the premiere, while emphasizing on the ‘amazing’ heroes in our lives. During the launch of the popular American series LOST, Zee Café created ‘the island’ where users could generate boarding passes and lucky numbers could win a real island trip. Interestingly, the winning numbers were flashed on the television screen during the first episode of LOST. Driven by the ultimate goal of bringing in viewers, TV series and premieres are certainly making it big on social media buzz. Aashiqui 2’s themed promotions both on online and offline, will not only help create a buzz but also help increase the fan base with ‘like-gated’ apps and relevant messages. What are your views on Aashiqui 2 social media promotions?